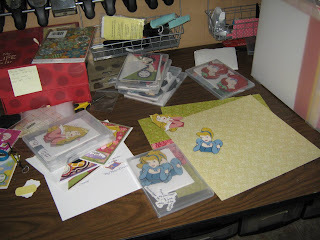 if I am ever going to finish the Naughty Princess cards!! Nooooo, I am not gonna shoot my paper but instead all the damn "SQUIRREL"s that keep popping up to distract me! I think I have a more difficult time staying focused when I have a large project to finish because I want to move on to something else but still have so much left to do on the project and I keep finding even the smallest of "SQUIRREL" distracting! 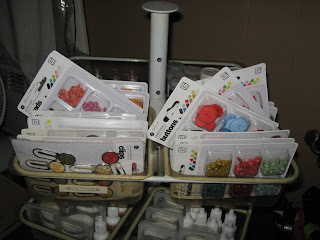 One "SQUIRREL" that hit me was that my order from Happy N Scrappin came in and of course I had to put that stuff away but ran into a wall when I had to think of a way to store the brads and buttons! Shari had a great clearance sale on Basic Grey and I was able to pick up a bunch of stuff for 75% off. 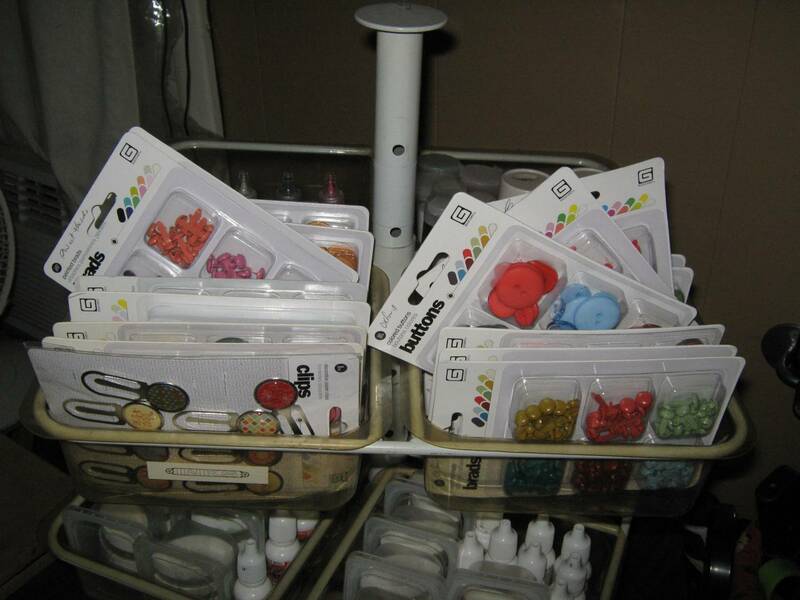 Here are some of the items in my Plaid Essentials Spinner for now until I get some more small containers to put them in. Here is a picture of how I like to store my Basic Grey collections of brads. 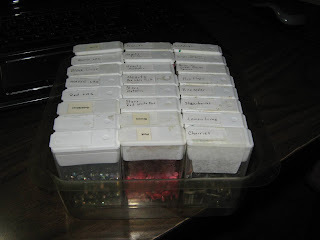 These are the containers that I get the small brads from Hobby Lobby in and I always save them as they are emptied. I printed labels so I know which collection the brads go to and I find them more easily. As you see in the previous picture, I don't have enough containers and that presents a problem for me! Me and my damned organizational issues!! 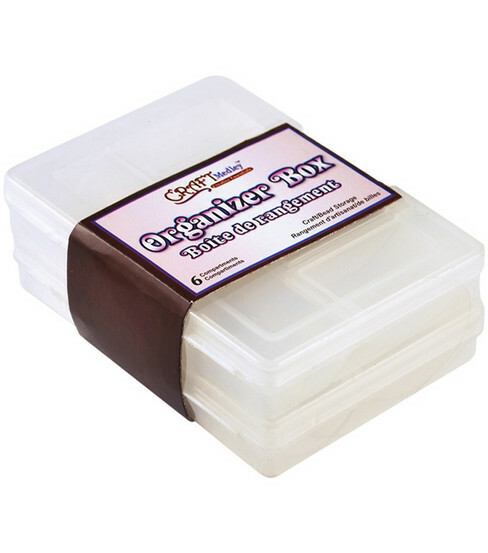 I spent time online yesterday looking for some similiar containers and wasn't having much luck and then I went to Joann.com and found something for a great price. Only problem is that I don't have a Joann's locally and I don't want to drive an hour to get them. One benefit of Facebook is that I have over 1,500 friends on there and I get a lot of response to many of my posts. A friend of mine, who is a really good friend to my boss/friend Khrystal said she had to meet Khrystal today and would be glad to pick up some of the containers for me! WOOT WOOT! Since I am talking about brads I thought I would show you another way I store brads. My friend Naomi has to have Tic Tacs at night because her mouth gets dry from being on oxygen and they help keep her mouth from drying out so much and started giving me the empty boxes a few years ago. Oh and BTW, Naomi is doing rather well and has completely adjusted to her living situation at the assisted living center. She is actually rather spoiled by the staff there but if ya'll remember anything about me and Naomi you know that is exactly how I think it should be! *okie smiles thinking of how she always had Naomi spoiled*. Here is a side view of the boxes. It makes it nice being able to see the brads easily but I do often put a little label on the top so I can find them more easily. 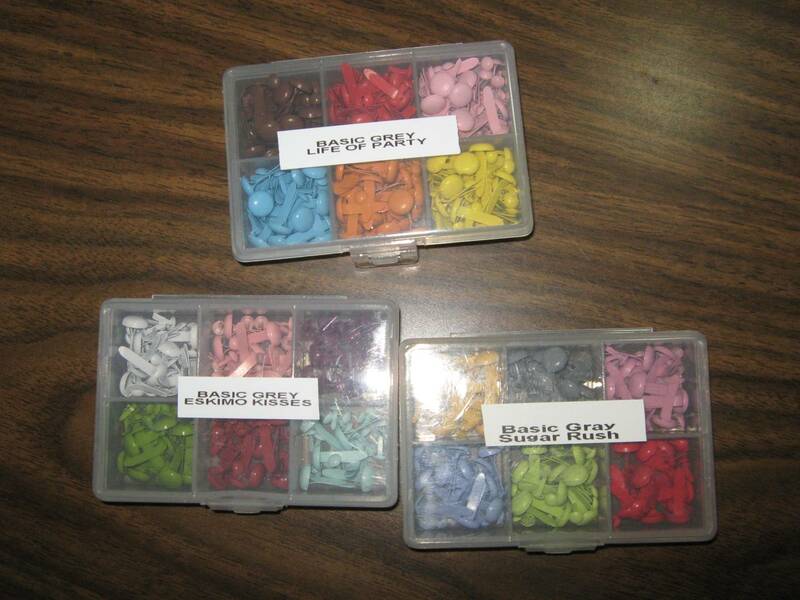 I have a lot of shaped brads I use mostly for layouts and I got those at Eyelet Outlet. They often have some great clearance sales and their shipping prices are awesome, they never trump up the shipping and handling. Okay guess I better get back to work on either the cards or my progress notes from last week. But first I must finish my coffee!! The Tic Tac boxes are and awesone idea! Several years ago I bought boxes very similar to this and have never thought about the similarity until now....free is better! Can't wait to see the Naughty Princess line again! That is a brilliant idea with the Tic Tac boxes. Wow! I would have never thought of it. Well... I am glad the "squirrels" are the fuzzy, mammal kind! But for heaven's sake, don't shoot the craft supplies!!!!!!!! 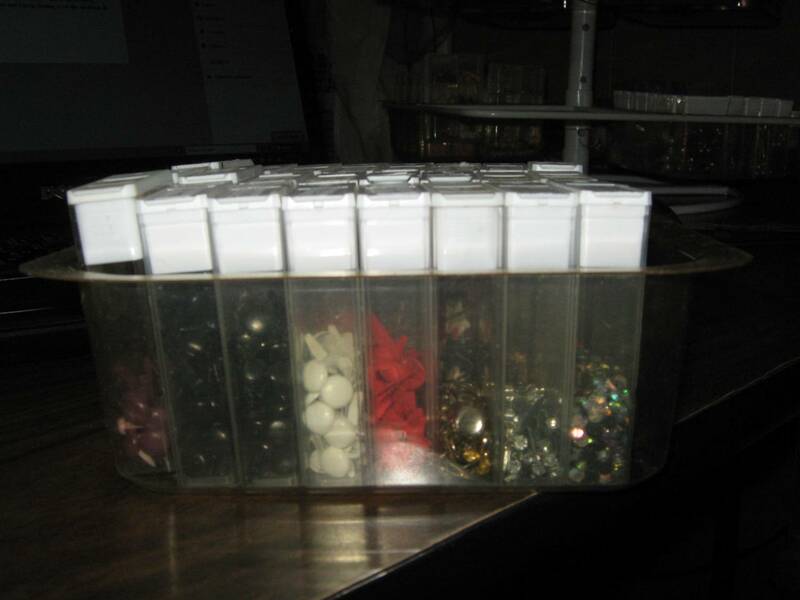 Always love your organizing ideas!